Is Ian Somerhalder leaving The Vampire Diaries? The show doesn’t have a lot of life left in it, and I would say that another season is guaranteed, but more than that? Eh, it’ll depend on ratings and contracts and money, but don’t expect any of the leads to be all that enthused about renewing their deals – especially Ian. Technically speaking, the show did still kill Enzo, and an top of Ian’s other problems, he’s probably irritated his requests weren’t honored – even if he was joking. But in addition to that, Ian clearly has a problem with Damon’s and Elena’s romance on the show, calling it a situation of ‘cradle robbing’. He’s expressed his interest in Damon dating someone his own age, and I’m sure that also has a little something to do with the fact that his love scenes with Nina Dobrev are probably beyond awkward right now, especially if Nina has been hooking up with Michael Trevino! And in addition to all that, there are rumors that Damon is being killed off in the 5th Season finale. He revealed in a recent interview, “I’m actually excited to see what happens. Stuff you just didn’t see. It is definitely a cliffhanger.” He was also rumored to have stated, “When Damon dies it’s the dopest thing.” Eh… I don’t really think Ian would have given away such a big spoiler [if it’s true], so take that with a grain of salt. And he could have also been speaking metaphorically, of course. But with all these rumors on Ian’s departure, I’m guessing that even if he lasts through Season 5, we’ll still be saying a permanent good-bye by the end of Season 6. Do you agree? Let us know your thoughts in the comments below. Ian Somerhalder and Nina Dobrev’s Ugly Breakup Threatens The Vampire Diaries – Show Might Be Cancelled Due To Split? 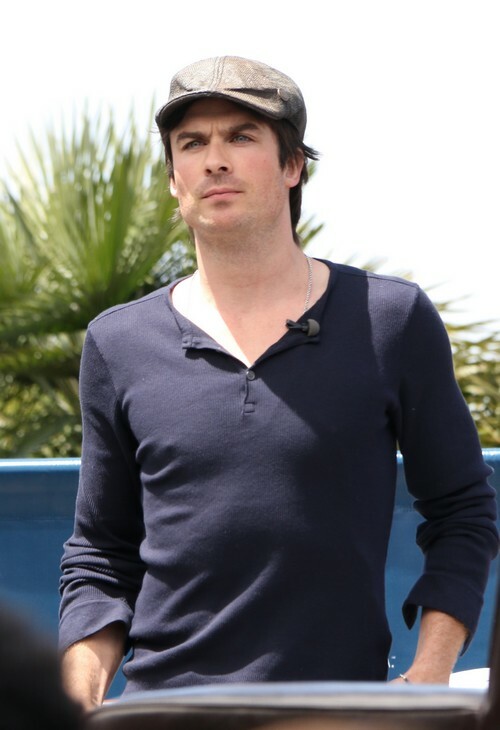 Ian Somerhalder Outraged: Nina Dobrev and Michael Trevino’s Casual Hookups Breaking His Heart!